Tim is an Adjunct Professor of Behavioral Sciences teaching courses in Equine Therapy at both The University of Vermont and Northern Vermont University. He holds a BA in Psychology from The University of Vermont class of 1967. 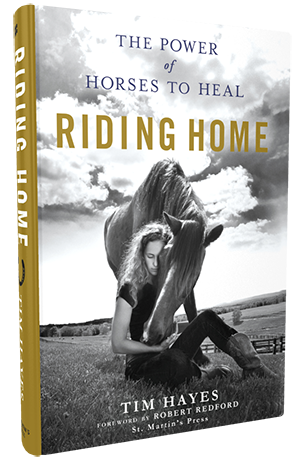 Tim teaches Equine Therapy Clinics, it’s principles, methods and techniques, based on his Best Selling Book RIDING HOME: The Power of Horses to Heal. To learn more about Nonprofit Organization Fundraiser Book Events and Clinics contact Tim at: tim@hayesisforhorses.com or 917-816-4662. Tim Hayes is also an internationally recognized Natural Horsemanship Clinician working throughout the United States, Canada, Europe, Australia, New Zealand and Mexico. He offers 1 and 2-Day Clinics and at any location for both English and Western riders of all levels and all disciplines. To learn more about Natural Horsemanship and Clinics with Tim Hayes visit: HayesisforHorses.com. Tim is also a Natural Horsemanship Instructor at The University of Vermont and The University of Connecticut Departments of Animal Science. He is a Contributing Expert Consultant & Columnist for: Equus and Equine Journal Magazines and a Contributing Columnist for The Huffington Post. Tim lives with his wife Stephanie Lockhart Hayes and their horses in Vermont. Stephanie is the Founder of The Center For America’s First Horse: CenterforAmericasFirstHorse.org which offers many unique horse programs including Natural Horsemanship for Children. Watch video.